Aileene Hanks was born on 8 September 1933 in Missouri and died on 24 November 1997 in Alabama. Sadly, little information about her seems to be available, yet according to her obituary in the Bangor Daily News of 28 November, 1997, she recorded 18 gospel albums and appeared on the Grand Ole Opry. 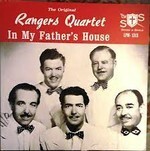 The Rangers Quartet recorded the original version of Aileene Hanks's most famous composition, "In My Father's House." The exact date of their recording is unknown, but it was probably no later than 1953, as tenor Denver Crumpler featured on it and he left the group that year. It is possible, however, that the recording was made as early as 1949: see this page. The recording was released on the Rangers Record Of The Month label, number RA-1016-A. If the label numbers were chronological and the releases were truly monthly, the record was issued in February 1951.